When you’re juggling five or six classes with various assignments, tests, and other deadlines, sometimes the Calendar application on your iPhone or iPod touch just isn’t enough. Class Notes from InterThread Software is a helpful application that attempts to tackle this shortcoming. For the most part, it succeeds. A Touch of Class: In addition to helping you keep your schedule straight, Class Notes can also store notes, contact info for professors and classmates, info on upcoming assignments and more. When you first launch the app, there are eight different sections to tap on, but be sure to start with Class Organizer. Almost all information you’ll enter into the app will be here. You can add courses with title, instructor, location, Web site, and schedule. But there’s a problem here: The time dial only supports hours and half hours, which is completely absurd. I can only guess that whoever designed the app never went to high school or college, or went so long ago that they can’t remember that classes don’t always start on the hour or half hour. As long as you enter the classes’ actual times in your Calendar app, it won’t mess up the other things you have to schedule during the day. Still, it’s just silly that the times are set up this way in Class Notes. After you’ve entered a class’s basic information, you can open it up and add notes, contact information for professors or classmates, assignments, and tests. 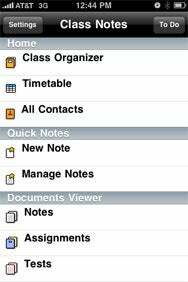 Once all your classes are stored in the app, Class Notes gives you a number of options for viewing their details. The timetable gives an overview of your schedule. (Remember, though, the times will be slightly off if your classes don’t ahead to the app’s hour/half-hour view of the world.) Notes displays all of the notes saved for your classes, Assignments shows every project and paper on your plate, and “Tests” every upcoming exam. There’s also the Quick Notes option for general information you need to take down on the fly. This app is extremely useful for students and teachers alike. It’s great that you can look at your classes from so many different perspectives, and it’s more or less intuitive all the way through. Even the price, a measly $1, is another reason to get it. I just don’t understand why it won’t let me input a 2:10 to 3:25 p.m. class. Hopefully, that’s a flaw that can be addressed in a future update. Otherwise, this is the app I wish I’d had in college. In fact, I might hold onto it in anticipation of graduate school.